The Metropolitan Museum of Art in New York City has several new exhibitions this summer. One of my favorites is the Heroes exhibit with costumes that actors wore on movie sets, including Christian Bale's Batman and Tobey McGuire's Superman costumes. Very elasticy.. We weren't allowed to take pictures sadly, so you will have to go there to see if yourself. 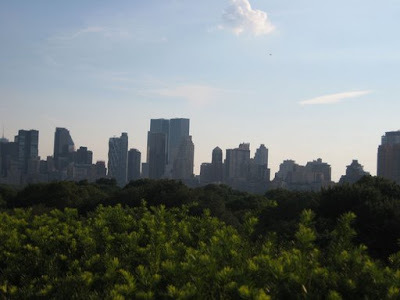 The other exhibit was the Jeff Koons on the Rooftop, where you see a magnificent view of New York City overlooking Central Park. My favorite Jeff Koons' creation was the big yellow dog. (Nope, not Clifford- he's red) It was a pretty sight..
where'd you get the SuperHeroes pic? 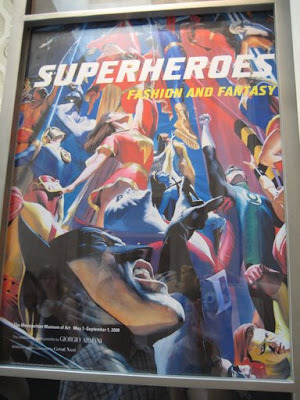 The SuperHeroes picture is the sign visitors see before they enter the exhibit at the Met. I would encourage you to go visit before the exhibit closes.